In our experience, kayaking is a summer activity. Although we know that there are some crazy winter kayakers out there, most of us are looking to store our kayak somewhere dry and out of the sun over winter. Did you know that leaving your kayak out over winter can cause damage? There are a number of precautionary measures you can take to store your kayak and make sure that it doesn’t suffer damage. 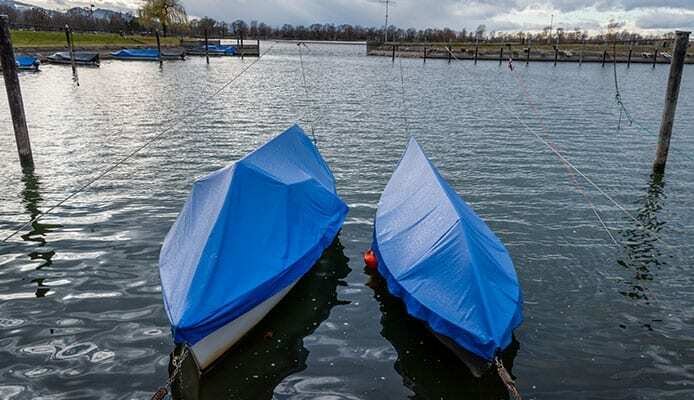 We’ve spent time checking out the best kayak covers on the market in 2019, so read on to find out how to protect your kayak over winter. The Richermall kayak storage bag is a brilliant solution when it comes to protecting your kayak from the elements. Made from a waterproof, UV reflecting and durable material this cover can protect you kayak in all weathers. The elastic drawstring makes fitting the cover and taking it off a piece of cake, so your kayak will all be wrapped up in no time. Sizes: available to fit kayaks between 8 and 18 feet. The Gymtop waterproof kayak cover has all the features required to protect your kayak from rain, wind, sun and snow. 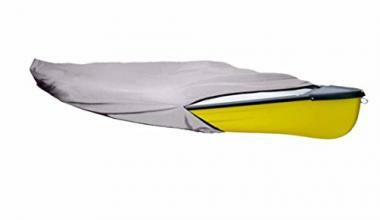 Perfect for off season storage, this is a top-rated kayak cover for outdoor storage. The cover features ripstop fabric meaning that the durable material will hold strong against sharp edges keeping your kayak safe. 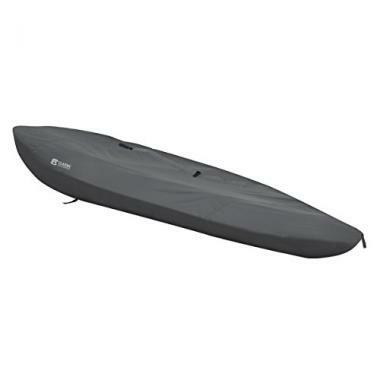 The Maymii kayak cover is made of the incredible durable 210D Durable oxford Taffeta material has a glossy surface which is certain to protect your kayak from all weathers. Available in a range of colors, this cover also has the drawstring to make it easy to take on and off. The Stormpro kayak cover works slightly differently from the earlier covers in our list. Essentially a kayak bag, instead of a drawstring to tighten the cover around your kayak, the Stormpro uses zips to keep your kayak safe and dry. Made with 600D polyester, the material won’t shrink or stretch and will remain durable over time. 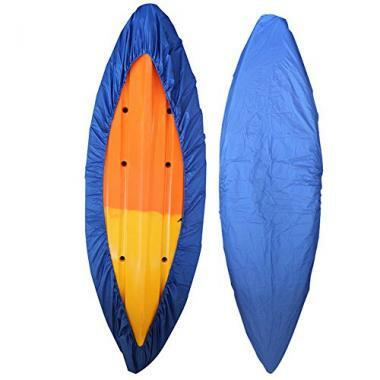 Sizes: available to fit kayaks in all sizes up to 16 feet long. The Mexidi cover is another variation on the classic drawstring kayak cover design. It looks great and has everything you need to keep your kayak safe and protected. With a variety of colors available on the external side of the cover, the inside is a glossy silver. 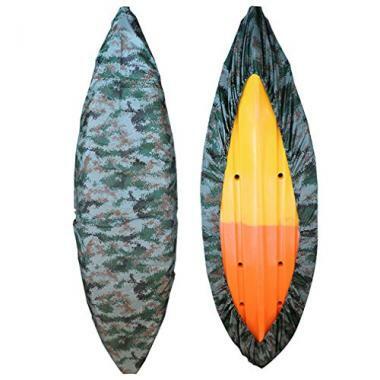 This is a great option for those paddlers looking for a low priced option. We really like this kayak bag for outdoor storage. The Icover kayak cover is a clean, sleek option for a variety of sizes of kayak and is more of a kayak bag than a cover. The reinforced zipper protects a weaker area of the bag and makes it more durable. Conveniently, when not being used, the Icover kayak can be zipped into an easy to carry bag. The Docooler kayak cockpit cover is designed to only cover the cockpit of your sit in kayak. 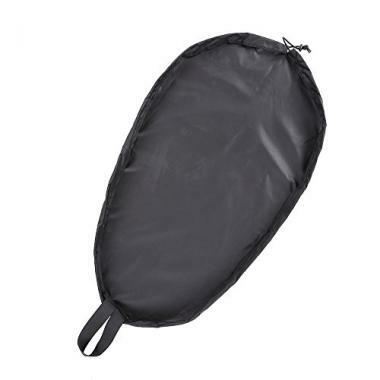 This prevents animals and insects and animals from getting in and making a nest of the inside of your kayak. The seams are double stitched and uses seal seams to weatherproof the cover, so you know that it has been engineered to get the job done. The great thing about this kayak cover is that it comes with a 2 year warranty meaning that you know you’ve got a product that is going to last. The lightweight material keeps it easy to wrap over your kayak, and the high quality stitching will give you the confidence that it isn’t going to tear. The focus of the Hobie kayak cover is to strap your cover down tight. Made from a tough and heavy weight material this may be a better option for paddlers for kayak covers for outdoor storage. Of course, the material comes with all the UV and water-resistant features that you would expect from the tough looking material. Fits kayaks between 9 feet and 16 feet. The Danuu deluxe kayak cover comes with 4 side adjustments and a drawstring perimeter to ensure that your cover remains tight to your kayak. 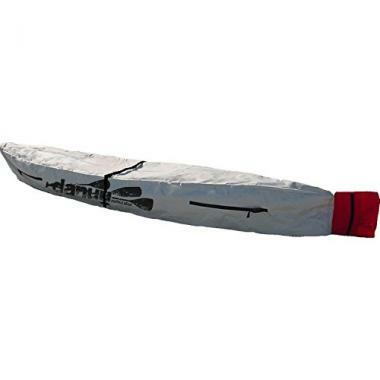 Simple to pack down and pack down into a small red satchel, this kayak cover has been designed for easy storage when not being used, and fold down into a neat satchel bag. 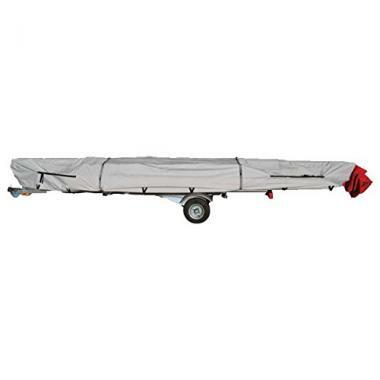 Sizes available to fit kayaks between 12 feet and 18 feet in length. There are no differences between covers for kayaks or canoes, the only important thing to do is make sure you get the right size. When it comes to the material of the covers however, there are plenty of things to look out for. Look for something that is waterproof, and any sign that it can withstand sharp objects and potential rips and tears. For canoe covers that have zips rather than a drawstring it is important that the cover is double stitched and that the seams are lined to ensure that they remain waterproof over time. 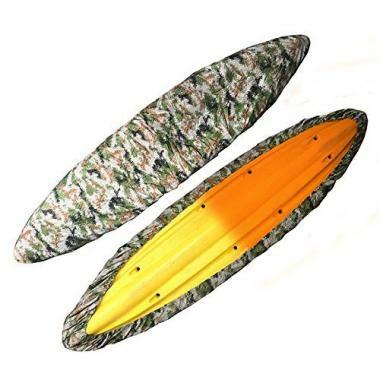 Not all covers are for outdoor storage, so when looking for a kayak or canoe covers for outdoor storage make sure to select extra durable material. There are a number of features that covers for kayaks may have to ensure that it remains waterproof for long periods of time. An initially good sign is that the cover has warranty, this shows that the manufacturers have a strong confidence in the materials. Secondly the material itself should be clearly water resistant. Polyester and Oxford Taffeta are strong materials that are known to hold up their waterproofness over time. Another important consideration is the tautness of the cover over the length of the kayak. If the kayak cover can be strapped down tightly, there is little chance of water pooling on the cover and causing damage. Any extra straps that mean that the cover is tight, and water runs off the material rather than pooling on it helps waterproof the kayak. The more durable your kayak cover the better. Look out for covers that come with specifically designed materials that stop rips and tears. 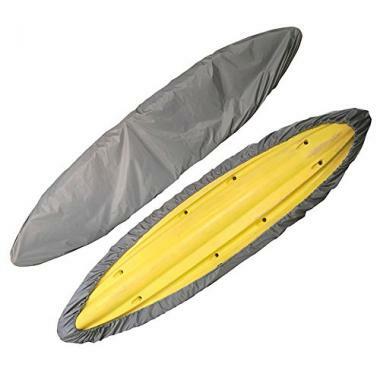 Most kayak covers are made from fairly heavyweight material, however stronger materials often come with the compromise of being heavier or more expensive. UV protection is essential for protecting the paintwork of your kayak. Long term exposure to UV rays can begin to weaken the plastic of your boat and cause imperfections and failures. 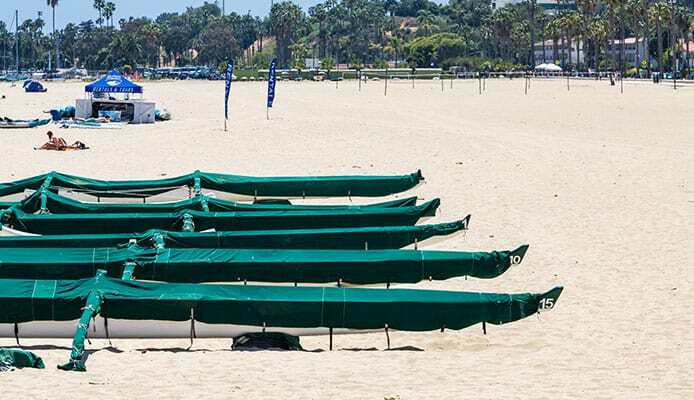 Top rated canoe covers will always be UV resistant, and we’ve made sure all of the covers on this list will keep your canoe or kayak safe from the sun. In what way is the cover secured to the kayak? There is no point buying a cover that hangs loose from your kayak or one that doesn’t properly secure it. There are a number of different ways that kayak covers seal, the most common being a drawstring elastic paracord. Another option for closing off the kayak cover are zip seals, which are also highly effective and provide a sleeker more complete style to your kayak bag. What are kayak/canoe covers and why would I need one? When reading kayak cover reviews make sure to check what kind of kayak cover your looking at. There are two variations of cover within this list. Kayak covers, and cockpit covers. Both are important for securing different types of kayaks in the off season. Cockpit covers are used to protect the cockpit of sit-in kayaks. This prevents water pooling and causing damage inside the kayak. Cockpit covers also stop small animals finding your kayaking and using it as a dry warm nesting place for the winter. Kayak covers on the other hand are used to completely protect your kayak against the elements when not it in use. They are an essential tool for the maintenance and the storage of your kayak and ensure that your kayak will not become damaged while not in use. When using a kayak cover, it is important to make sure that your kayak is completely dry before attaching it. Yes, almost all kayak covers are waterproof. The key two things that cause damage to a kayak are UV rays and water. Kayaks suffer general wear and tear due to exposure to the elements, so kayak covers work by limiting the wear and tear they experience when not in use. There is a broad range of kayak covers available and new designs have entered the market in recent years. We really like the growing trend in kayak bags, zip up covers that are a nice sleek fit over the body of your kayak. If your less bothered about look and just need something to put over your kayak in the winter months than any of the options here will work for you. Just make sure to buy the right size and you’ll be able to keep your kayak safe and protected.